At the end of August 2014, I participated in my first cooking competition. The contest was sponsored by the Bloomington Garlic Festival. The recipes only condition was it must contain 6 cloves of garlic. Simple enough, right? Challenge excepted! Believe it or not, I won first place that day. Winning this contest was a thrilling feeling, almost addictive. Now that I know how fun and stimulating these recipe contests can be, I am motivated to compete and create in future contests. I am eager to share what I have learned. In my winning recipe, roasted garlic serves as the focal point. By knowing that garlic actually has a somewhat high sugar content. About one fourth of a garlic’s chemistry is composed of ten kinds of natural sugars. These include fructose, glucose, inulin and arabinose (Fulder and Blackwood). Since roasting garlic helps caramelize these sugars, I decided to use roasted garlic in a sweet treat. While uncommon, it actually makes sense. A garlic dessert would be whacky enough to get the judges attention. Mixing roasted garlic, saffron, and pear juice I created an interesting sorbet with a peculiar sense of harmony. This garlic sorbet is easy to replicate and does not require an ice cream maker, so try this recipe at home for a unique garlic experience. Garlic Saffron Sorbet Note: The Garlic Saffron Sorbet is comprised of three main components. These components are Saffron Syrup, Pear Juice, and Roasted Garlic Cloves. The components should be prepared simultaneously. Once the individual components are completed, the Sorbet recipe is on the next page. Place 2 sheets of aluminum foil on top of each other, then fold into a pouch. Cut the tops off of all the garlic and place into foil pouch. Pour canola oil over top the garlic. Fold over the pouch so that it seals. Place garlic packet in oven for 40-60 minutes. After 40 minutes check garlic frequently. The garlic should be tender to the poke of a fork. Cut pears into quarters and place in water. Bring water up to a gentle simmer and let pears infuse with water. Feel free to smash pears with a spoon or whisk. After 45 minutes of simmering, strain the water mixture into a measuring cup and reserve 1 cup of pear juice. Combine cane sugar and water in a heavy bottom, medium-sized pot. Bring the mixture to a simmer and whisk until sugar dissolves into the water, then remove the pot from the heat. Wait until water stops bubbling, then add the saffron. Place a lid on top of pot, reserve until the other components are finished. Combine saffron syrup, pear juice, lemon juice, garlic cloves and salt into a food processor or blender. 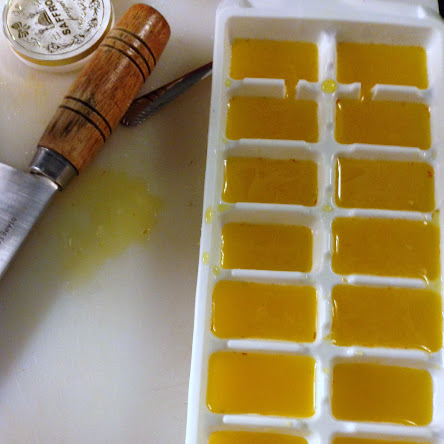 Pour mixture into ice cub trays and let freeze over several hours or overnight. 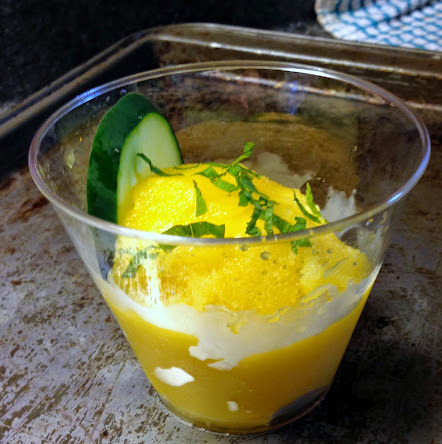 Put ice cubes back into a clean food processor and blend until sorbet consistency. Either serve immediately or freeze until desired texture. Fulder, Stephen, and John Blackwood. Garlic: Nature's Original Remedy. N.p. : Healing Arts Press, 2000. Print.